Early honey gathering. 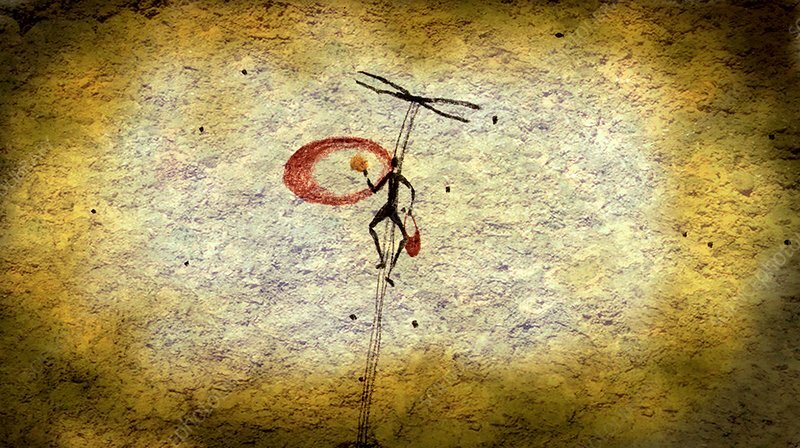 Reconstruction of a cave painting that shows the earliest evidence of the gathering of honey from bees. Cave paintings like this were found in caves in Spain and dated to between 8000 and 15,000 year ago. They show human figures on ropes, harvesting honey from the hives of wild bees in cliff faces. The human figure is using smoke from a burning brand to make the bees docile. The black specks are bees flying around the hunter-gatherer as he harvests the honey.